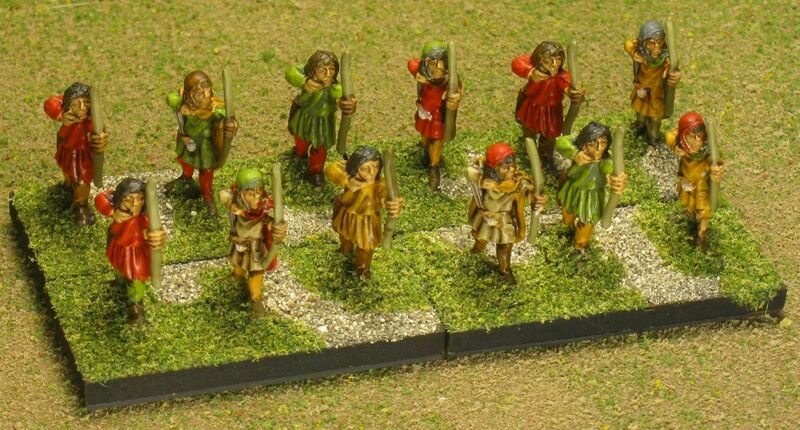 Soon after I started playing DBA again in about 2009, I decided that I wanted an Early Hungarian (III/67b) army. It’s been a long journey since then, but finally my quest is complete! I finished a double army just before Cold Wars. Double DBA army III/67b; mixed manufacturers. 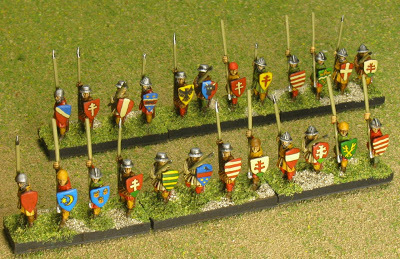 Early Hungarian knights by Essex and Black Hat (Gladiator). I was attracted to this army for several reasons. I am 1/4 Hungarian, and identify most closely with that part of my heritage. The composition of the army itself seems almost perfect for my tastes: 2x3Kn, 1x3Cv, 3x2LH, 3xSp, 2x3Ax or 3Bw, 1x2Ps. 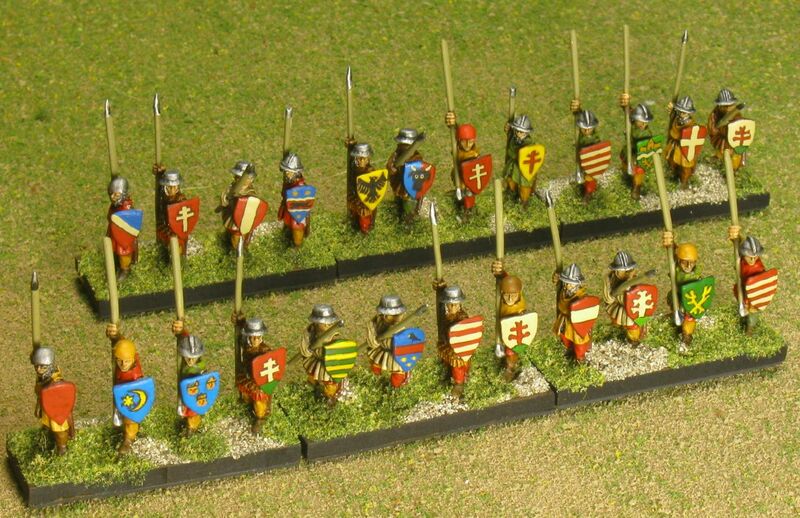 It’s one of the few Medieval combined arms armies I’ve seen with more than one Auxilia. 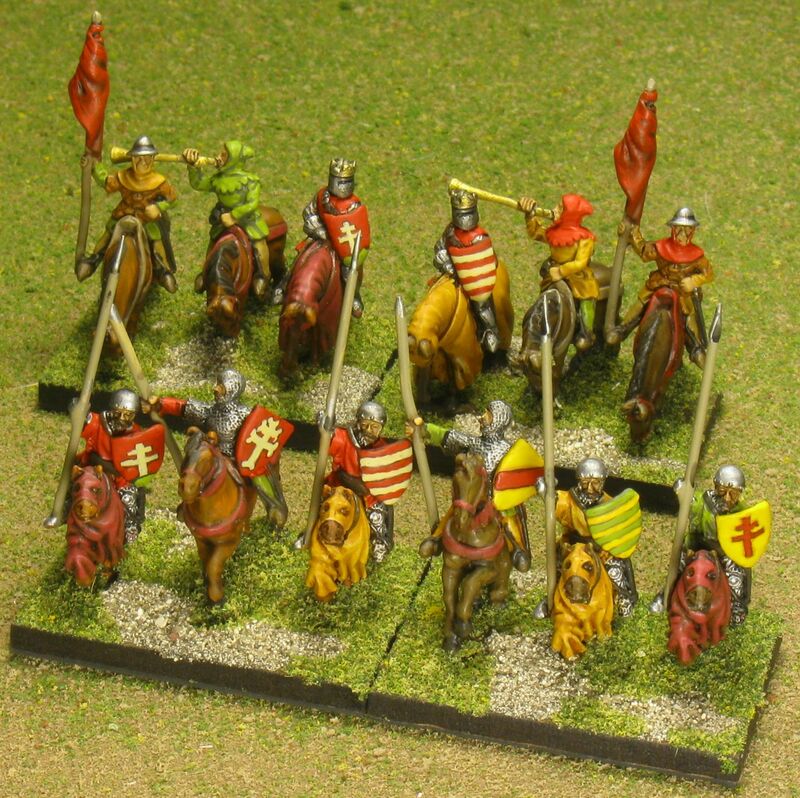 It also fits well with other armies I have from the same period: German, Leidang, Polish, Russian, and Mongol Conquest… even though I bought most of those armies only because they were good enemies of the Hungarians I didn’t have yet. My first attempt at building this army was purchasing a “not for the squeamish general” army pack from another gamer on the Fanaticus forums. It had the proper composition, but as I should have expected, I didn’t like the figure selection very much. It was mixed manufacturers, but chosen based on whatever he had lying around and not based on what he thought the army should look like. After not painting it for quite some time, I donated it to Mike Kaizar, who is still working on it. Hungarian spearmen by Black Hat (Gladiator). My second attempt came when Wargames Minis had a clearance sale on their Essex Miniatures packs. 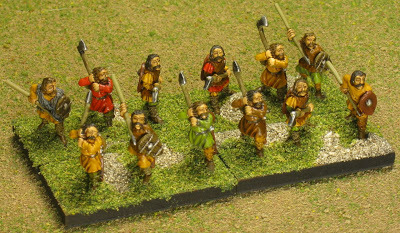 After long research discovered no good solution for Early Hungarians, I settled on buying a bunch of Essex later Hungarian figures that might work. They were so cheap, I bought two armies worth! But when it came time to actually paint them… I hated them. 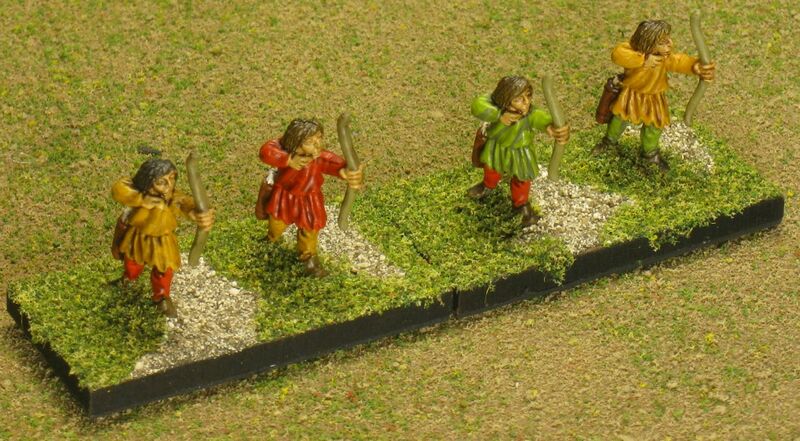 Closer inspection showed me that they were far too late for any part of the Early Hungarian list. By this time it was late 2012, and I needed this army for Cold Wars 2013. After talking to David Kuijt, I settled on the figures shown here. The General stands and a few of the other knights are Essex figures from my previous order. 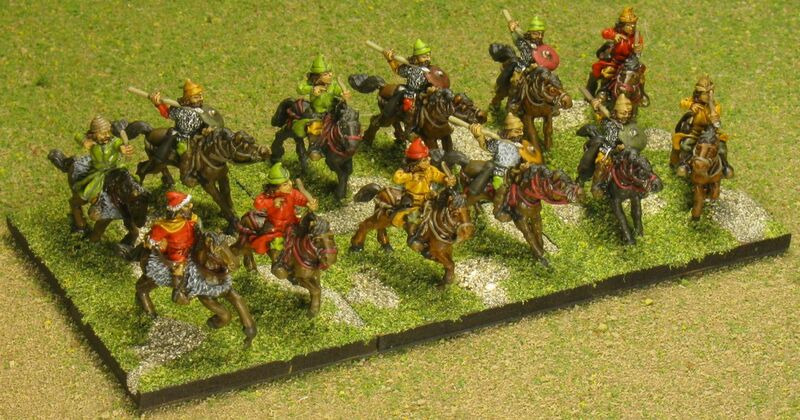 The remaining knights, light horse, spears, bows, auxilia and psiloi are all Black Hat figures from their Gladiator range. The Cavalry are a mix of Essex figures, Black Hat, and a few whose manufacturer I do not know but I happened to have on hand. 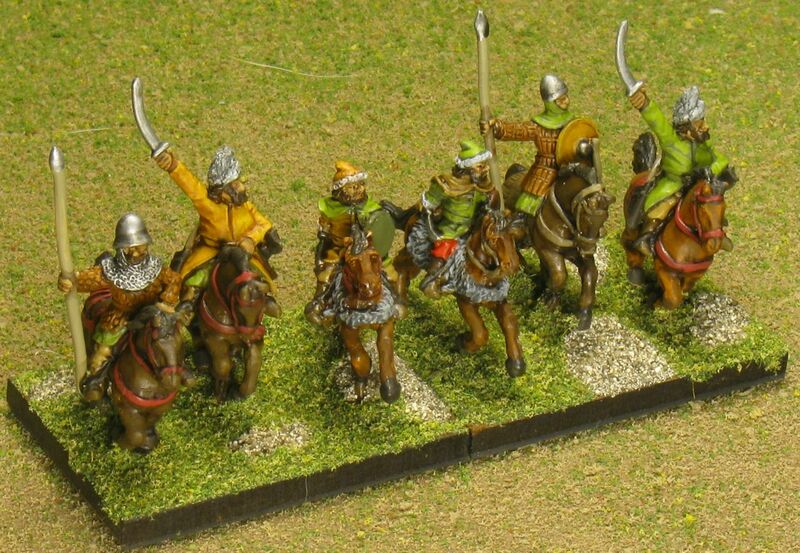 Early Hungarian cavalry by Black Hat, Essex, and others (unknown). The Black Hat figures are not specifically sold as Hungarians, other than the knights with round helms. Many of them are from their general Feudal range, and some are from slightly inappropriate areas, but look good enough that I wanted to paint more of them. Early Hungarian Psiloi by Black Hat (Gladiator). 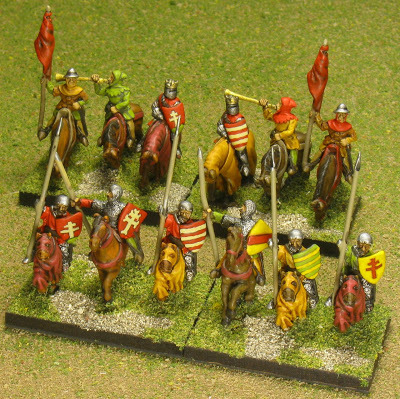 I knew the primary heraldry I wanted to use was red and white, but I didn’t want another red and white army since it’s the most common color combination I have. David told me that repeated heraldry wouldn’t be common in this period, but I am also not a fan of a widely varied, garish palette. I decided to use a lot more yellow and yellow browns, and rounded out the palette with green. It’s definitely not red and white army I feared it would be. Hungarian Auxilia by Black Hat (Gladiator). I’m not sure if I prefer the green and the brighter reds I used here, but otherwise I’m quite happy with the color scheme. For the white on the shields, I used an “extremely off-white.” It’s closer to beige than white, but in contrast with the surrounding colors it’s bright enough, and doesn’t add too much contrast. Looking at the shields, I’m reminded of Hoplite shield patterns more than garish Medieval heraldry. I’m very happy with the way this army turned out. After playing it in BBDBA and the campaign at Cold Wars, I also enjoy the way the army plays. Now I just need to figure out what to do with all those Later Hungarian figures, since that army has so few spears compared to this one.